Our friends across the pond at Knight Frank just released their Q3 2012 Prime Global Cities Index which our firm and Douglas Elliman in NYC and Miami contribute content to. Miami was #3 after Dubai although that placement was exagerated by the drop in distressed sales in south Florida (and they will rise going forward). Still, Miami has come a long way in 2 years. Manhattan showed decline but most of that was attributable to the shift in mix to entry level sales as mortgage rates continue to fall to new record lows. However it’s quite interesting to look at Manhattan as more mundane a market than the super-luxury segment would suggest. Further proof that the top end is not a proxy for everything else. Cities such as Dubai, Miami, Nairobi and London are increasingly considered investment hubs for HNWIs in their wider regions. In the wake of the Arab Spring, Dubai has been seen as a relative safe haven for MENA buyers while Venezuelan and Brazilian investors have looked to Miami to limit their exposure to domestic political and economic volatility. 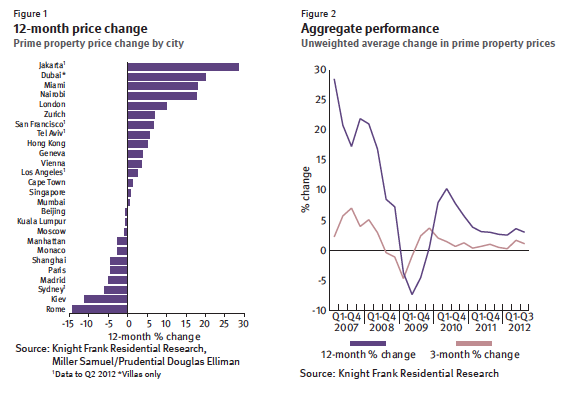 -Fifteen of the 26 cities tracked by the Prime Global Cities Index (58%) recorded flat or positive price growth in the year to September, but over the last quarter 20 of the 26 cities (77%) have seen flat or positive growth – indicating an improving scenario. -The index now stands 18.7% above its financial crisis low in Q2 2009 with Hong Kong, London and Beijing having been the strongest performers over this period, recording price growth of 52.9%, 45.4% and 39.5% respectively. -Five cities recorded double-digit price growth in the year to September; Jakarta, Dubai, Miami, Nairobi and London – a city from each of the five key world regions. Here’s a great research piece from Knight Frank on the state of housing in many of the world’s cities. South America is dominating other regions in market performance right now. Canada shows strength (all the HGTV shows seem to be filmed there) and why isn’t Greece falling harder? 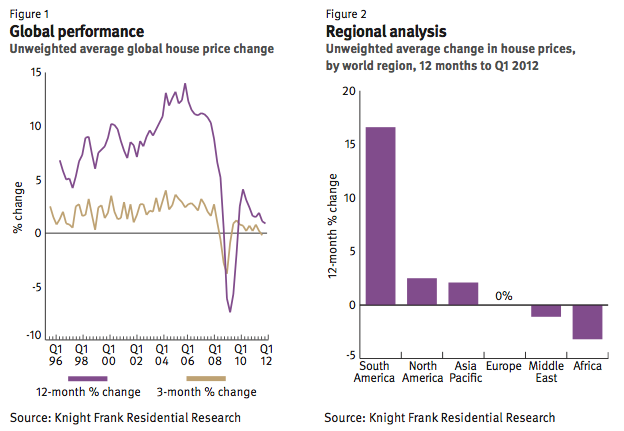 Knight Frank published their The Global House Price Index recorded its weakest annual performance since the depths of the recession in 2009, recording only 0.9% growth in the year to March 2012. Doubts over the Eurozone’s future, along with the Asian governments’ staunch efforts to cool their markets and deter speculative investment, have taken their toll. The Wealth Report 2010 was released today by Knight Frank Research. It is a much anticipated annual survey targeted at the high end consumer with great detail on global residential property trends. The report covers 56 high end housing markets across the globe. Check out The Housing Helix podcast for my interview with Andrew Shirley, Editor and Liam Bailey, Head of Residential Research for the Knight Frank Wealth Report 2010. I had provided commentary on the NYC housing market for the report. Monaco saw prices as high as $5,900 p/SF US. 73% of cities saw year over year declines versus 40% last year. 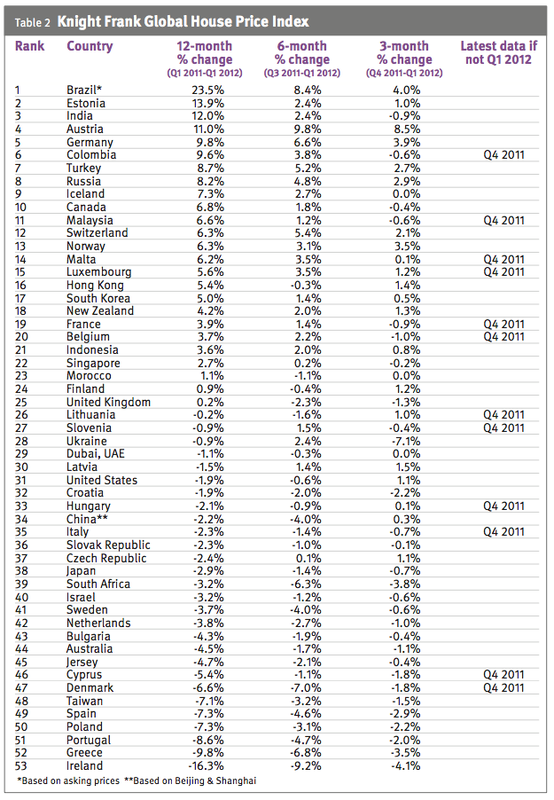 Middle East down 27.5% – the largest decline – Dubai showed a 45% drop. Asia Pacific up 17.1% – the highest increase – Shanghai showed a 52% gain. In light of this strong growth, the Hong Kong government has threatened measures to restrict the market – notably through mortgage lending restraint, reducing, for example, the mortgage limit for luxury property from 70% to 60%. Despite these potential restrictions the market continues to grow. This example points to an interesting development. The crippling impact of property bubbles bursting in Europe and the US has created a much more confidently interventionist approach in China, Hong Kong and Singapore (where cooling measures were introduced in September last year) among other markets. Update: Just came across the Bloomberg video and my interview giving a quick take on the US luxury portion. About my light postings over the past week – my kids are on school break, I had been working on the release of yesterday’s Long Island Queens Market Overview as well as prepping for expert witness testimony given yesterday and an exciting development for Miller Samuel to be announced soon. I’ll be back on track next week. KHS Real Estate has traded emails with me periodically and are avid readers of Matrix. They provide real estate market information and commentary through their web site and blog. In the city of Paris, the average squaremeter price for old and unoccupied apartments stood at â‚¬ 5,772/ USD 7,842.99 during the 4th quarter 2006. Once again, the 6th arrondissement around “Saint Germain- des- PrÃ©s” has been the most expensive (â‚¬ 8,586/ USD 11,667.09 per squaremeter), followed by the 7th ( “MusÃ©e d’Orsay”- “Invalides” – “Eiffel tower”/ â‚¬ 8,307/ USD 11,289 per mÂ²) and the southern Marais ( 4th arrondissement, â‚¬ 7,951/ USD 10,806.20). The districts in the north- east remain the most affordable: the 19th ( “la Villette”) cost â‚¬ 4,571/ USD 6,212.45 and the 20th â‚¬ 4,774/ USD 6,488.34 per squaremeter. These are the official numbers released by the Paris Notary Chamber on a new conference on 3 April 2007. In 2006, the annual price increase was 9.9 % for the whole of the City. However, the market lost steam and weakened toward the end of the year. According to the Notary Chamber, the prices in the 6th arrondissement “Saint Germain- des- PrÃ©s” rose by 13.7% and in the 8th arrondissement “Champs-ElysÃ©e” by 6,5% ( increase per annum/ 4th quarter 2006). During the year 2006, exactly 36,824 old and unoccupied apartments were sold in Paris, compared to 38,229 in 2005. Nonetheless, I want to emphasise that apartments in fairly good quality are sold within a margin of around â‚¬ 7,000 / USD 9,514.75 to â‚¬ 11.000/ USD 14,951.75 per square meter in the attractive central districts “Saint Germain- des- PrÃ©s” or in the Marais. Premium real estate on prestigious addresses reach price levels between â‚¬ 15,000/ USD 20,386.50 and â‚¬ 20,000 / USD 27.182 per squaremeter and more.